On Thursday afternoon I picked up Matt Fuddy and we drove the grueling five and half hours to Girard to meet up with his twin brother Jon and Mike Haines. We met at the Avonia Tavern for dinner and talked steelhead strategy. 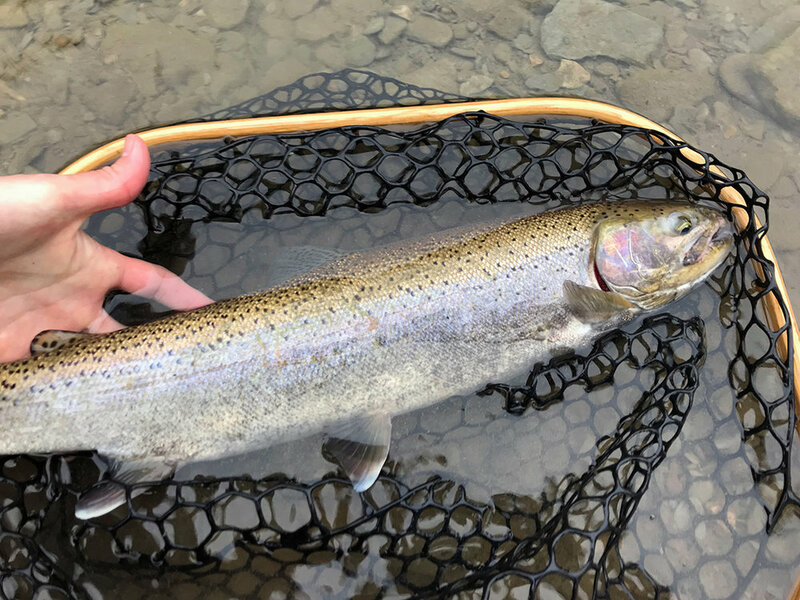 The fishing grapevine was buzzing about fish in Upper Elk Creek and a couple of the east side streams. Elk Creek being the largest body of water seemed like the logical choice for four guys and so we set our sights on Folly’s End Campground for Friday morning. The large hole at Folly's End Campground on Elk Creek. Friday morning came quick and although the calendar said it was spring, it felt like winter as we breathed in the morning air. We arrived at Folly’s End Campground a bit later than usual. This time of year, when the air temperatures dip into the twenties overnight, a thin sheet of ice forms on the water and it takes a few hours for it to melt. We were rigged up and on the water by 10AM and decided to fish the large hole behind the campground store first. There wasn’t a soul to be found on the water, but we did immediately spot several large steelhead holding in the deeper water. We all took up spots and started drifting egg patterns, squirmy wormies, and nymphs. I fished my Scott 10’-8wt which is a rod weight higher than what I’d typically recommend for Erie, but it works. After several minutes I had a steelhead take my squirmy pattern and he went berserk. After a two-minute fight, he threw the hook and had me second guessing squirmy patterns on barbless hooks. A couple of casts later I hooked up again and this time I was in the jaw solid. I fought and landed a beautiful 20” fish that had the classic gray tint of a drop back. During our time at this hole Matt and Mike also hooked up and landed fish. I can’t stay in one spot for long so I began walking downstream. Downstream and around the bend I came across a high slate wall with a water fall cascading down the side. In the turbulence created by the waterfall hitting the creek I swore I saw the tail of a steelhead. I put a drift along the wall and nothing happened. I added a second split shot and made the same cast. This time I saw a large brightly colored fish swim out and grab my squirmy. It was a large buck and he took-off downstream, shaking his head and rolling in the water. After a long battle on 5X tippet I finally landed this fish. It was an old battle-scarred buck, probably a drop back and wow was he neat. This fish had large sunken holes around its nostrils that gave it a distinct look. The battle scarred buck I caught on Elk Creek. I headed upstream with my buddies during the mid-afternoon. We found various pockets with one or two fish and even observed a few fish spawning. At a beautiful hole above the Rt. 98 bridge, we found a deeper run that allowed for long dead drifts. I could make out multiple shadows of fish in the swift current. We took turns drifting double fly rigs, frequently changing weight to find the lane we needed to be in. I felt my line go tight on my second drift and watched a fish dart downstream. I fought the fish the best I could as it jumped out of water and put on a show. I was fortunate to land this fish. Matt and Mike also hooked up and landed fish as well. All were drop back steelhead. While the guys were distracted, I snuck upstream and found another pool that looked promising. I found a hole that had a large tree that had toppled over into the creek. The colorful buck I caught by the blowdown several hundred yards above the campground. Its branches were submerged underwater creating a “steelhead hotel” and staging area of sorts. When the fish hide in cover like this it can be virtually impossible to coax them out. However, sometimes focusing on the upstream side, you’ll find fish staged above the obstacle and in this case, I did. I was able to get behind these fish to make a cast upstream. On my second drift, my indicator darted under the surface and I was able set the hook, fight and land another beautiful buck steelhead. I spent another hour exploring upstream and although I saw a couple of fish I was unable to hook up. Eventually the guys made their way upstream to see what happening. We decided to call it a day and headed to the Avonia Tavern for dinner. On Saturday morning we again waited a bit before we headed out. By the time we hit the water it was already getting close to lunch. We decided to start at the park area near Sterrettania and walk downstream. We ran into a couple of guys at the pool below the bend, both of who’d walked all the way from Folly’s End Campground. As they left, we wet our fishing lines and Mike ended up catching a fresh hen steelhead. I walked almost a mile downstream in this area and saw only two fish. At the bottom of this area, I ran into eight other guys fishing. I couldn’t believe they’d all walked that far. After leaving Sterrettania we decided to head to 20 Mile Creek. We made the 40-minute drive east and arrived at the Upper 20 Mile Creek access point near the Rt. 90 bridge, the area most folks refer to as the “Tomato Patch.” After the walk down the hill we hit the water and found it to be crystal clear. Combined with bright sunshine it wasn’t the best conditions for steelhead. We all split up and walked upstream. I found a nice run and spotted at least two steelhead. As I moved upstream I fished the runs, drifting my egg patterns right along the ledges where the fish like to hide. Then to my surprise there was a giant explosion in the water and I watched a large hen steelhead take my veiled egg pattern. Looking downstream on 20 Mile Creek. The large hen I caught on Saturday morning on 20 Mile Creek. This fish fought like a champ and it was so cool to hold her. I walked further upstream and eventually found some large steelhead in a deep pool that were holding under a large tree that’d blown over. These fish were incredible but impossible to get a drift to. After fishing 20 Mile Creek we decided to head back west for the evening and went back to Elk Creek to the hole we’d fished the evening before. In our first fifteen minutes back on Elk we landed several beautiful steelhead. We ended our night early because of cold feet and because the reality was that most of us were satisfied with what we’d caught. We again capped the night off at the Avonia. One of the steelhead I caught after we headed back to Elk Creek on Saturday. On Sunday morning I usually head home, but Jon still hadn’t caught his first Erie Steelhead and I was determined to get him one. Mike decided to head home, but Matt and Jon and I drove back to 20 Mile Creek to fish the water downstream. During our walk we again found many fish hiding in debris in the stream, making them impossible to target. At one such location, Jon decided to throw a natural looking nymph and with a squirmy wormie dropper. As I was heading further downstream, I heard Matt shout at the top of his lungs. Well, that was Jon hooking up and landing his first Erie steelhead. I was so happy for him because I remember how awesome that feeling is. About that same time, I stumbled across a long riffle that appeared to hold some fish. I started drifting a bead tipped pink egg pattern. After several drifts, I added a second Dinsmore split shot to get down closer to the bottom. On the next cast my indicator stopped mid drift and I lifted my rod and out of the water came the head of a giant steelhead. This fish was huge. As I was fighting him Jon and Matt had made their way downstream and were watching. This fish was so big it reminded me of fighting a salmon. With Jon’s help I was able to get this fish in the net. He was a beauty, perhaps my personal best steelhead. I measured him before releasing him and he came in at 27”. I can’t confirm he was larger than fish I caught in Oak Orchard in 2017, but he was close. As I lifted him out of the water, milt was pouring out of him telling me these fish were still very much in spawning mode. The 27" buck I caught on 20 Mile Creek on Sunday morning. After walking to the lower boundary line, we headed back to the car. We ended the day with a celebratory lunch at the Freeport Restaurant for Jon’s catch. Before we sipped on drinks I said “Here’s a toast to spring run Erie steelhead and Jon’ first!” After a very late lunch the three of us headed back to southeastern Pennsylvania, another Erie trip in the books.